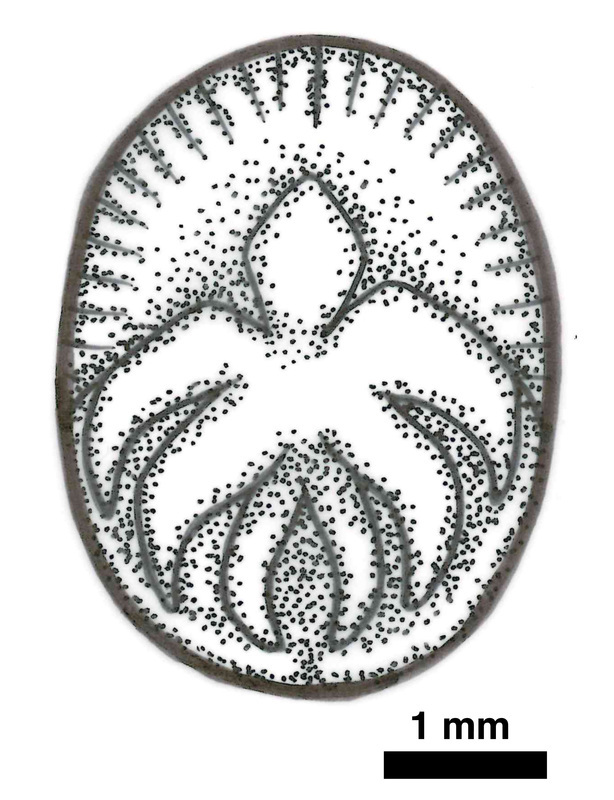 Praecambridium sigillum was a small, almost flat Ediacaran organism of just a few millimetres diameter, possessing at least three pairs of tapering appendages and a central sub-rounded lobe decorating its dorsal surface. It appears to have been bilaterally symmetrical. Glaessner & Wade (1966) first interpreted Praecambridium as a basal arthropod, but little has been published on this genus since, and a contemporary interpretation is overdue. In South Australia, Praecambridium is only found at specific sites where a fine grain-size offers a greater resolution of preserved features - perfect for observing small Ediacaran organisms. Oval disc-shaped bodies less than 5 mm in length and under 4 mm wide. One is slightly conical, rising 0.15 to 0.2 mm above the bedding plane; the remainder are flattened. The surfaces of the casts each bear three pairs of small raised lobes and an axial lobe. These lobes are more or less confluent in the centre. The axial lobe of the best-preserved specimen bears another pair of small lobes laterally. All the paired lobes taper to pointed outer ends which are directed towards one end of the disc. This is here considered the posterior end. The axial lobe is rounded at the opposite (anterior) end.